Probate Law Attorney: Beverly Thomson Shaw P.A. Beverly Thomson Shaw, P.A. handles probate law, special needs trusts, estate planning, powers of attorney, and more for the St. Petersburg, FL area. Home, hospital, and nursing home appointments available. 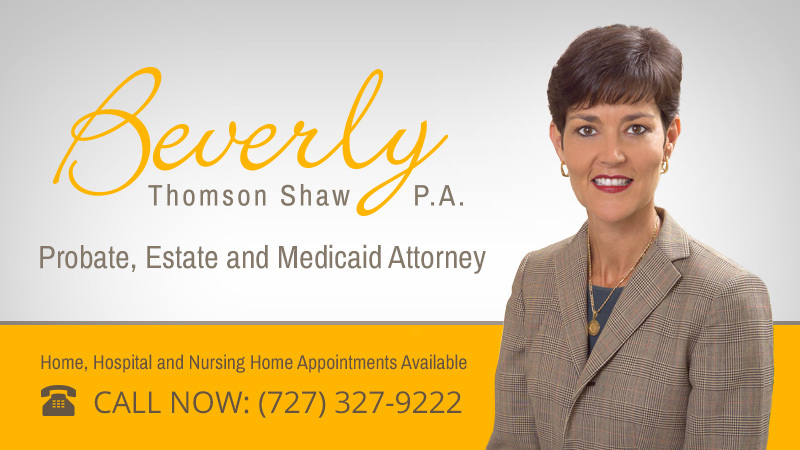 Beverly Thomson Shaw, Esquire, is an Elder Law Attorney who concentrates in Medicaid Law, Probate Law, and Estate planning. With 15+ years of experience in the greater Tampa area and a law degree from Stetson University of Law, this native Floridian is here to provide comfort and protection throughout your Medicaid and Estate planning processes while helping you avoid probate. Learn more about Beverly Thompson Shaw, P.A. or visit our Frequently Asked Questions page for more information. Copyright © 2019 Beverly Thomson Shaw, P.A.